Today started just like all the others, breakfast and then group devotion. We like to gather in our room, it's quiet, comfortable and intimate. The boys bring in chairs if they don't want to sit in the rockers, I'm on the bed along with the dogs who are taking their early morning nap, and Preston is seated at the desk. Noel has recently chosen to be the reader of the daily devotion. We are reading from the book "Jesus Calling". The message of the devotions in this book speak of experiencing God's presence. So, Noel begins to read the devotion and I follow along the best I can because it is read in Spanish. I scan the others in the room and see that Freddy may not be paying attention to the reading. I stay quiet and watch Freddy. Now, to be fair, if I'm watching Freddy, then possibly I might not be paying attention as well as I should to what is being read. But, Freddy has really got my interest. As I write this I have to laugh because it is so comical. The reason for Freddy's lack of attention and his most recent obsession is, Preston's feet. Preston has his feet propped up on the desk and Freddy is poking them. He pokes here, he pokes there, and Preston is letting him. This is a surprise because Preston usually doesn't let anyone touch his feet, he is horribly ticklish. Freddy is very intent on poking and looking at Preston's feet. Next, he measures the size of Preston's feet with his hand. Remember, this is all going on during the reading of the daily devotion. After the reading, it gets to be too much for Freddy and he has to ask questions of Preston about his feet; how big are they, why do you have these bumps, do they hurt? Forget about the discussion that usually takes place after the reading, today that is not on the radar screen. The feet is what has the attention now by all the others. We go from discussing Preston's feet, to discussing Shaq's feet (you know, the basketball player), to who can stand up and touch their hands to the floor without bending their knees. Somewhere along the way, we have completely lost sight of our morning purpose and this seems to be the course that we yielded to. We did get back to the devotion and it's meaning in each of our lives, but today I trust that we needed to let things flow in a different direction. It was a time to allow the boys to just be boys. To be silly and be comfortable with openly expressing themselves. Sitting in a family environment and experiencing the everyday silly things of life is a fairly new concept for the boys. For so many years they were never allowed to be children. And today, it was important for them to just BE. Earlier in the week, I was talking to Israel about Freddy and his need to always be touching something, to be checking out something, to be moving something. Is it curiosity or ADD? I haven't got it figured out yet; but this story is just a little glimpse into life with Freddy. While I'm sitting at the desk trying to get my computer up and running again after a major overhaul. Freddy walks into the room shirtless but he does have a shirt in his hands. He walks over to the TV room and stands in front of the TV. He takes one hand and wipes all the dust off the top and back of the TV. Then he takes the shirt and spreads it out on top of the TV; it's his Barcelona shirt. I look at him, laugh heartily and I ask him "Should we pray over the game today, too?" "YEAH", he says. Today is a big game being televised. What game you ask? The only game that matters in this house with the boys - SOCCER. This is the Barcelona versus Real Madrid game. Our boys are on the tail end of their summer break from school so this is a perfect way to wrap up summer vacation. Freddy is very affection with the dogs. Every morning and evening he likes to come into our room and nuzzle the dogs; kissing them, stroking them and talking to them. A couple of months ago, I remember Freddy telling Mordecai "you sure are ugly, but I love you so much". A family of several kids might also have a "Freddy" in amongst them. He's the one who is a free spirit. He's the one that keeps you laughing. He's the one that causes you to scratch your head and ask yourself - where's he coming from with that nonsense or that idea. He's the one that will have you exasperated one minute and loving him to pieces the next. He's the one that brings us great joy. Are we the only people on earth that ask the question from time to time "are we making a difference"? Since becoming missionaries 5 years ago, we have asked ourselves this question occasionally, especially in the year 2012. We minister to a culture different from the one we have known all of our lives. 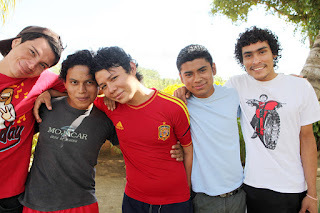 We are still trying to learn the Spanish language and we think that we experience a great deal of misunderstanding when we try to communicate with the boys in our care. Everyone who has ever raised teenagers knows that there is a lot of repetition in regards to instruction and correction. You tell a teen the meaning of a rule, procedure or responsibility and it seems that within 1 hour you are having to repeat yourself because of their lack to carry out the verbal instruction. Did they misunderstand you; or are they being teenagers and turning a deaf ear; or are they being teenagers by pushing the limits to see how much they can get away with? At any given time we are probably dealing with at least one of the these scenarios. We scratch our heads continually, telling ourselves "they don't get it, they don't understand what we are trying to do here". This week has been especially difficult, one of the hardest we have endured in our almost 3 years living in Nicaragua. We have lived over a week with little to no water. That's another story for another time. Anyway, we have had to repeat instruction to the boys in how to live during this period of no water. Repeat, repeat, REPEAT and still no change in behavior. So, Thursday afternoon we had a very short meeting with the boys, told them what we expected of them and they had until Friday morning to make some decisions. On Friday morning, we had another very short meeting talking to the group as a whole and then had each boy come into our office for a private meeting. Each boy shared his thoughts and asked questions about anything they wanted to talk about. We are on different levels of being able to communicate with each one because of the knowledge of English in each boy and our knowledge of Spanish. With our language skills and the use of Google translation and a Spanish dictionary, we were able to talk without using an el traductor (translator). It was 3 hours of intense communication and a freedom to share from their hearts. Every other time, we have always had group meetings and there was never much input from the boys. Having one on one private time seemed to really work, or it was finally time to open up. The other factor that may be responsible for the boys to open up, is the vulnerability from us. We share with them our struggles, past, way past and present. And we tell them, when we mess up, that we are sorry and we were wrong. Each boy shared what this program means to them and what they wanted to accomplish from it. One boy shared his disappointments and another shared the deep desire for his life. Two boys shared their gratitude for the opportunity that we are giving them. One boy shared he'd be dead on the streets if he was not here with us. One boy said "where I lived before, I worked hard ALL the time and they gave me nothing. Here I work very little and you give me everything. " That statement blew us away. EVERYTHING! What a word. Everything, that can mean a lot of things: food, clothes, warm bed, hair cuts, medical, instruction, correction, discipline, fun and love. It felt good to hear that word - everything. Partners and prayer warriors be informed, the boys appreciate what you do for them. They know where the money comes from, You! They know where the prayers come from. We tell them that we can do nothing without people covering us in prayer. Together we are making a difference. As teenagers they may not express it often or in ways that show, but the gratitude is in their thoughts and hearts. They have told us so! !